Diwali isn't only about sweets. Savoury dishes are just as much part of regional traditions. 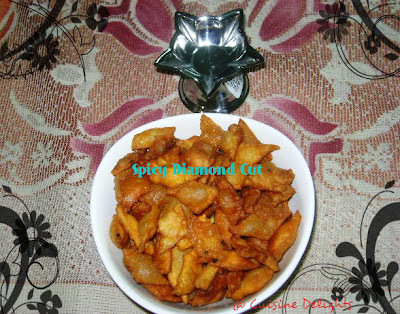 Spicy diamond cuts are also called as savory maida biscuits. It is a best evening time snack for all age group. It is made out of plain flour or maida flour and simple ingredients. It tastes crunchy and spicy with bursting flavors. Perfect to munch on teatime! In a wide bowl, add the maida, wheat flour, ajwain, nigella seeds, red chilly pwd, sugar and salt. Mix all the ingredients well. Knead the dough until its soft with little water and 2 tbsp of oil or ghee. Cover and let it rest for 30 mins. Divide the dough into large lemon size balls. Use a thin spatula to take out the diamond cuts from the rolling board. gentle when you gather while dropping. 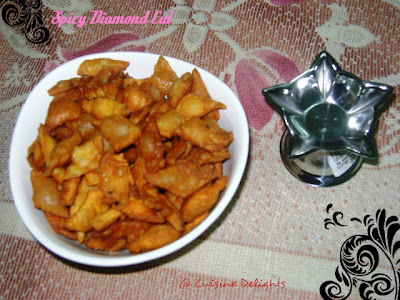 Deep fry in hot oil with medium flame and keep turning constantly for even cooking. Now slow down the flame and keep turning until it turns crisp & golden colour. Take out the biscuits and keep it on the paper towel to remove excess oil. Cool biscuits completely to room temperature. Now spread some chaat masala and black salt. Store it in air tight container to preserve crispness for long time..!